When you say lion, the first thing that comes to ones head is royalty and confidence,isn’t it ? The image of a lion represents supremacy, power and ferociousness. Lion, the King of Beasts is one of the most popular animals to get tattooed by men. So what do lion tattoos for men signify? 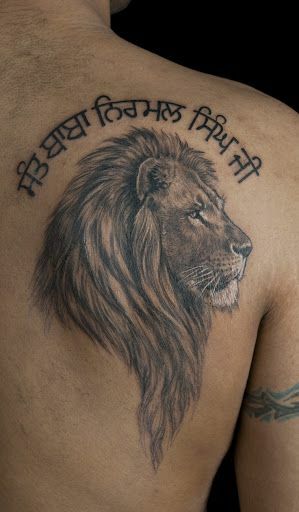 Lion tattoos for men have a lot of variations in forms and styles. So let’s walk through the various cultural perspectives and meanings of lion tattoos. As romantic as Greek mythology is, lions here are associated with masculinity and love. Lions signify God on account of its Royal stature and thereby has been known to depict justice a d power. The symbol ‘Lion of Judah’ also shows lion to be symbolic of Jesus Christ. Contradicting the common belief, lion tattoos with flowers are very masculine and popular in men as it symbolises a perfect balance between strength and fragility and the desire to find a middle ground between one’s calmer self and passionate nature.It also symbolises the recognition of feminine wisdom, love, elegance and beauty. Lions from the perspective of Chinese and Japanese culture symbolises luck, protection, guardian, strength and power. They basically symbolise honour, valour and justice according to the perspective of Samurai culture. Lion as we know by now represents strength, power and masculinity, whereas a lamb represents purity, innocence and spirituality. This tattoo depicts one’s dual nature with a balance between one’s rational and passionate side. These tattoos depict a combination of brute and power as both these animals are kings in their own realms. They represent strength, authority, masculinity and power. A roaring lion is very powerful and ferocious and someone to be feared and respected. They are leaders and a roaring lion tattoo is sign that one must not be taken for granted or taken lightly as there is a beast underneath that skin ready to be unleashed and strike. A lion paw tattoo signifies achievement, progress in life, bravery and protection. Lions do hunt alone but they have been known to come back to their Cubs and lioness and thereby reunite with its family providing them food and protection. Yes, lion is the King of the Jungle and a crowned lion symbolises the fact that you are your own King and no one can put you down or try to dominate you in anyway. The zodiac sign of leo depicts a lion and it is ruled by the run. This fifth zodiac sign represents high-spirited energy and adventuresome. It is said that the people born under this sign are born leaders, intelligent, extravagant, exuberant, savvy, just and are great at balancing their life professionally and personally. This New School style lion tattoo stretches across the outer deltoid. It features a brightly colored lion head and mane, greatly detailed with line work and shadowing. The lion wears a padlock on a rope around its neck, and the padlock is engraved with the letters “T & B”. 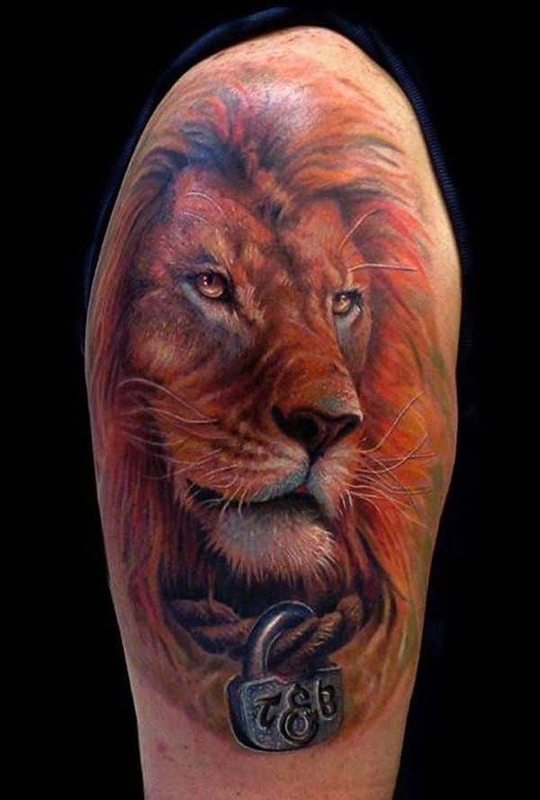 Lion tattoos are often used as symbols of power and regal traits, and this tattoo for men is a great example of that. 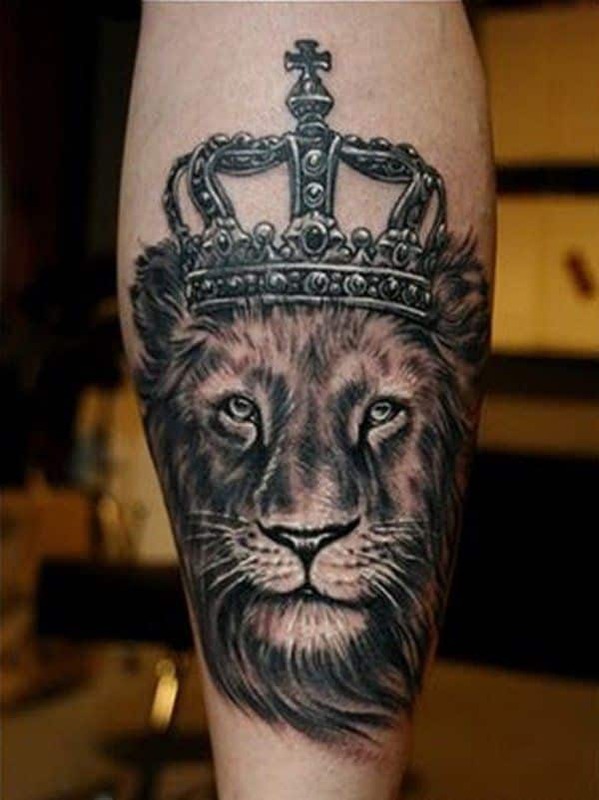 A black and white New School style lion wears an ornate King’s crown and stretches across the back of the calf. 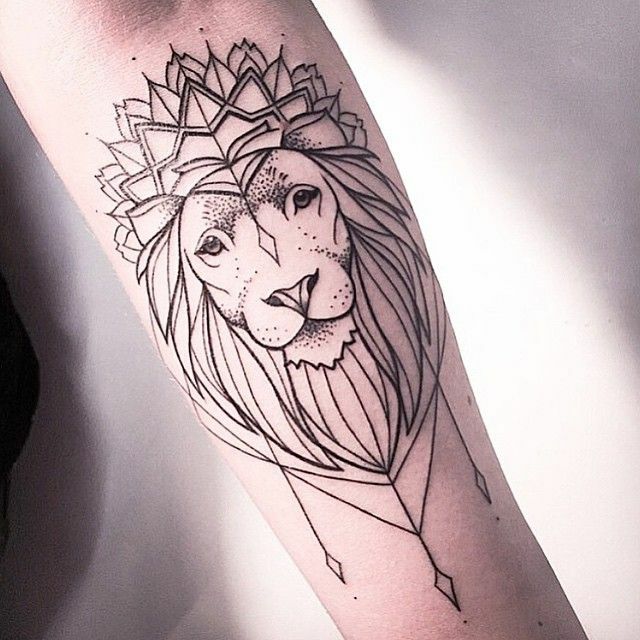 This lion tattoo for guys features combination Blackwork and Dotwork to create a geometric looking piece. The lion is perfectly symmetrical. Stunning mandala work stretches from the top and bottom of its face, and it is shaded with expert Dotwork. 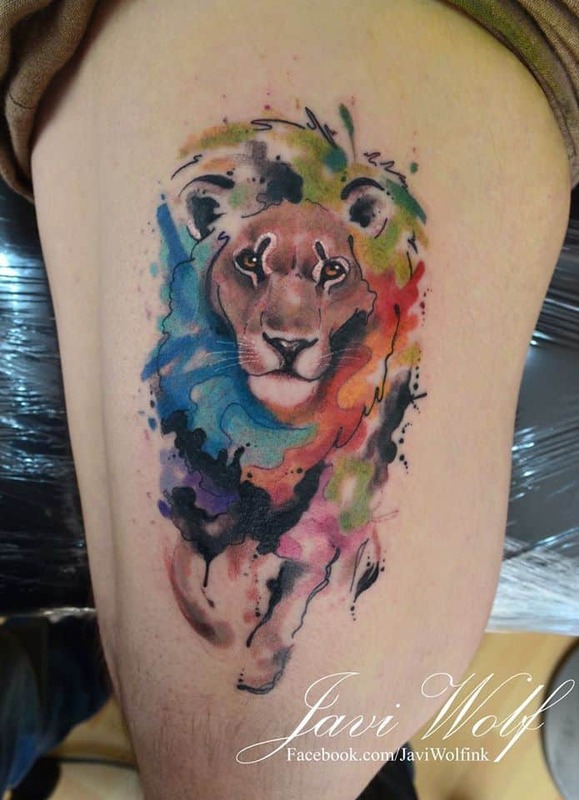 This Surrealism style tattoo features a great example of a water color lion tattoo for men. The lion is a splash of purples, golds, greens, and blues that drip from just below the knee to the bottom of the calf in pastel brush strokes. This Blackwork tattoo features a lion, in side profile, stretching his head across the chest and shoulder of the body. The black and white inking is henna inspired- the mane is intricately filled in with Blackwork mandala patterns, and line work shading. 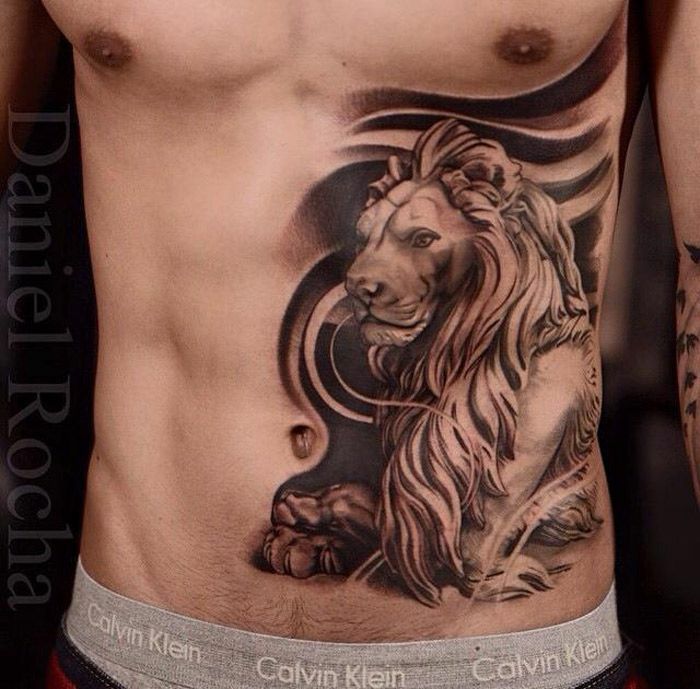 This black and white lion is a great example of animal tattoo ideas for men. It features a New School style lion in great detail, set upon the upper back of the shoulder. Arabic script arches in strong black ink above the lion’s head. This tattoo idea features a lion resting across the side of the lower side body, surrounded by swirling Blackwork. The lion is inked in strong, smooth lines and generous shadowing, so that it appears to be carved from marble. 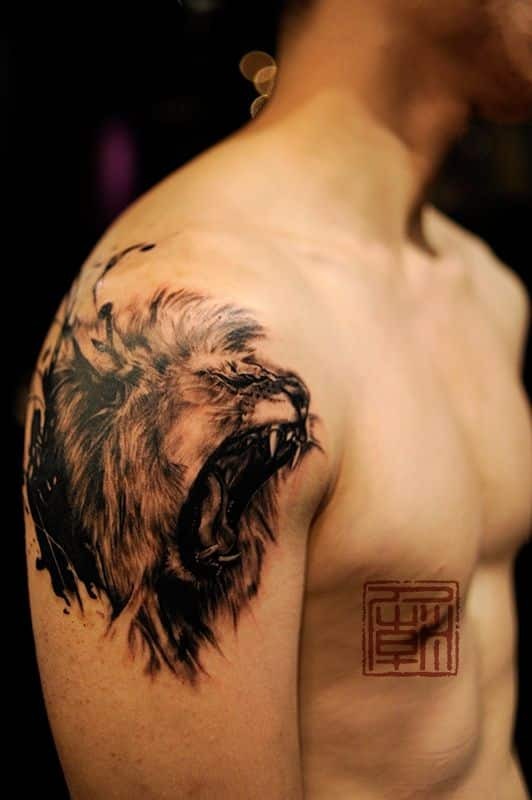 A lion rips through the skin of the outer deltoid in a burst of inky black in this tattoo for men. He bares sharp, detailed teeth, and his mane bursts across the shoulder in great detail and shading. He fades into an inky smear of water color brush stroke detailing. 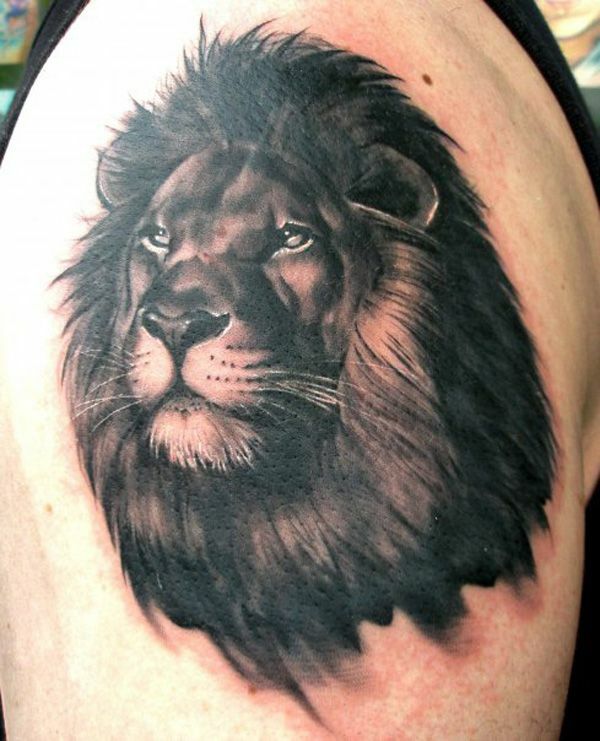 This New School style lion tattoo depicts a sombre faced lion staring out from the outer deltoid. The lion is inked in black and white, and depicted simply, yet very realistically, thanks to detailing and shading. 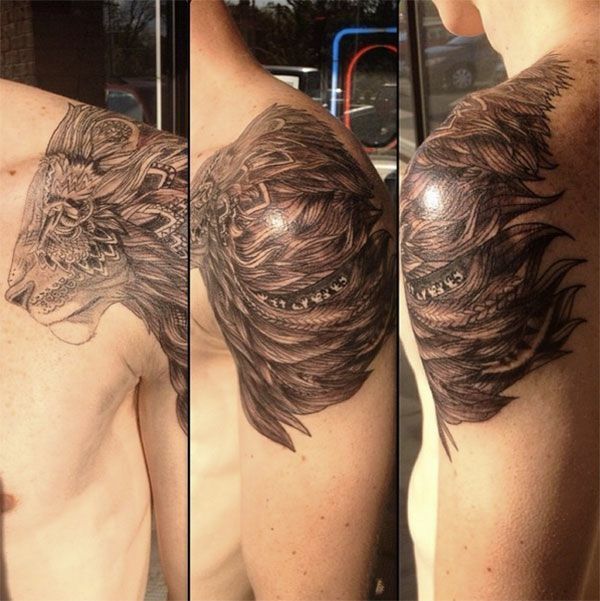 This Illustrative style tattoo features an abstract lion head splashed across the back of the bicep. 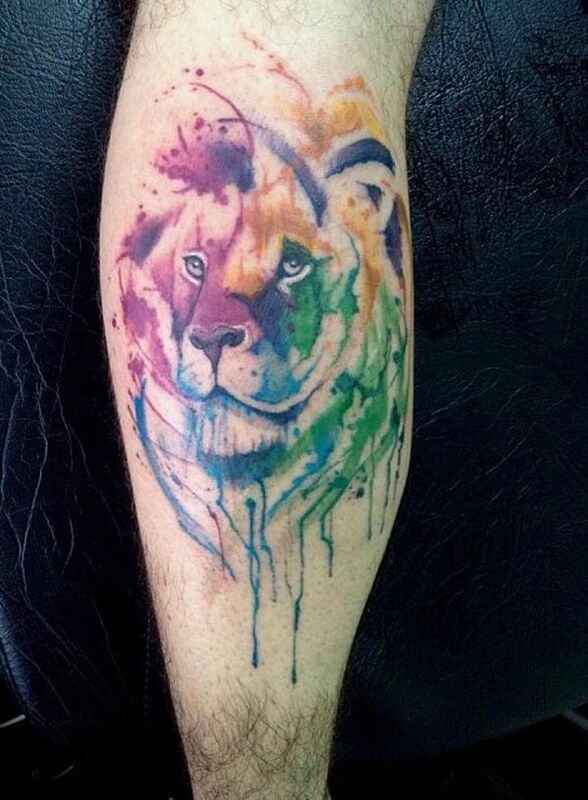 The sketch of a lion’s face is colored with a rainbow’s array of watercolor splashes. The colors run down the arm in stunning rivulets of pastel.